Number 47 Said To Number 3 - You're The Cutest Lesbian Werewolf I Ever Did see! Once again the Daily Mail has scooped all three top slots in today's Piffle Prize Awards for three idiotic headlines accompanied by three non-stories. 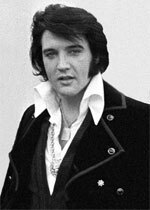 The winner by a wide margin, as selected by the judges, was 'Elvis Presley's Granddaughter Is A Lesbian Werewolf!' Which of course she isn't. It's just a movie. It's also a classic example of name dropping by the DM. The granddaughter in question is Riley Keough, the daughter of Lisa-Marie Presley, who is appearing in the movie 'Jack And Diane.' She isn't really a werewolf, and is probably not a lesbian either. The actor, formerly air-headed Rosie Webster from Coronation Street apparently wore an animal-print top on a night out in Mayfair with her boyfriend, Swansea City footballer, Scott Sinclair. Why this is put out as 'news' is anyone's guess, as Ms Flanagan's decision to keep her cleavage under wraps was probably motivated more by the lousy British weather, than a sudden attack of modesty. "Now that's what I call a news story!" Piffle Prize judge, Herman Boering enthused. "I mean, whoever heard of such a thing? A chap goes out shopping with his wife, and carries the bags! It's outrageous! This sort of thing must be stopped! Before we know where we are, we'll all be laden with shopping bags! Still, it'll make a heck of a story for the Daily Mail!" More from the PP judges when they next sit.